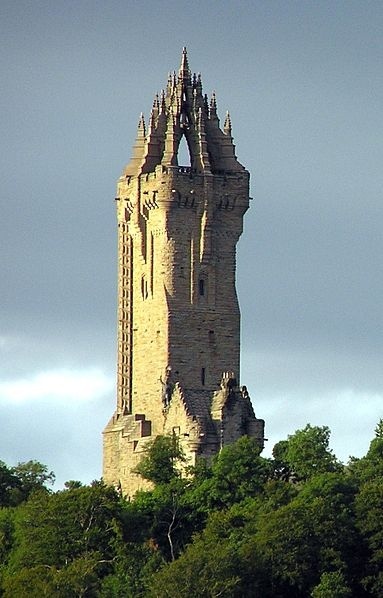 The National Wallace Monument (generally known as the Wallace Monument) is a tower standing on the summit of Abbey Craig, a hilltop near Stirling in Scotland. It commemorates Sir William Wallace, the 13th century Scottish hero. The tower was constructed following a fundraising campaign, which accompanied a resurgence of Scottish national identity in the 19th century. In addition to public subscription, it was partially funded by contributions from a number of foreign donors, including Italian national leader Giuseppe Garibaldi. Completed in 1869 to the designs of architect John Thomas Rochead at a cost of £18,000, the monument is a 67-metre (220 ft) sandstone tower, built in the Victorian Gothic style. It stands on the Abbey Craig, a volcanic crag above Cambuskenneth Abbey, from which Wallace was said to have watched the gathering of the army of King Edward I of England, just before the Battle of Stirling Bridge. The monument is open to the general public. Visitors climb the 246 step spiral staircase to the viewing gallery inside the monument's crown, which provides expansive views of the Ochil Hills and the Forth Valley.